The emerald ash borer has arrived in Pottstown. According to experts with the Pennsylvania Department of Conservation and Natural Resources, the borer will kill every ash tree in the commonwealth, most likely within the next five years. Ash trees are not only plentiful in Pennsylvania’s forests, they are one of the most common shade trees in our cities and towns. 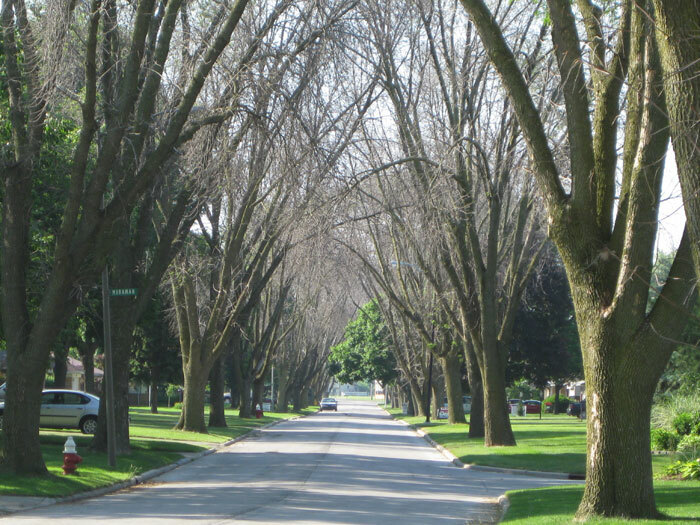 Only ash trees that are treated annually with insecticide will survive. The emerald ash borer, a wood-boring insect from northeast Asia, was first discovered in Detroit in 2002. Since then, it has spread throughout the Midwest, the border states, and the Northeast, killing tens of millions of trees. Adult females lay their eggs under the ash tree’s bark where they hatch. Larvae feeding in the cambial region disrupts water and nutrient transport inside the tree, resulting in 99 percent tree mortality with four to five years after the initial attack. The photos below, taken on a suburban street outside Toledo, Ohio, show the devastation the borers cause. Before the ash borer, above, and after, below. It's easiest to identify an ash tree when the leaves comes out. Ash trees have compound leaves with 5 to 9 leaflets per leaf. The leaflets are directly oppostive to each other. The most effective treatment is injecting an insecticide called emamectin benzoate (marketed as TREE-age by ArborJet) directly into the trunk. This must be done by a licensed pesticide applicator. The application should ideally be done in late May or early June, when the leaves are just forming on the trees. Although TREE-age is more expensive than other pesticides, it is the only treatment that lasts two or three years. The photo, below right, shows a manager for ArborJet checking a tree-injection treatment of an ash tree in Cleveland. Homeowners can purchase a "soil drench" from home improvement or garden stores. The most common pesticide used, called imidacloprid, is measured out according to product label directions intoa bucket or watering can of water and poured in a circle around the base of the trunk, as show in the photo, top left. Treatment should be performed in late May or early June. For specific directions, see this 3 minute video by the Purdue University Extension Service. Be sure the label lists emerald ash borer as pests killed by the product. 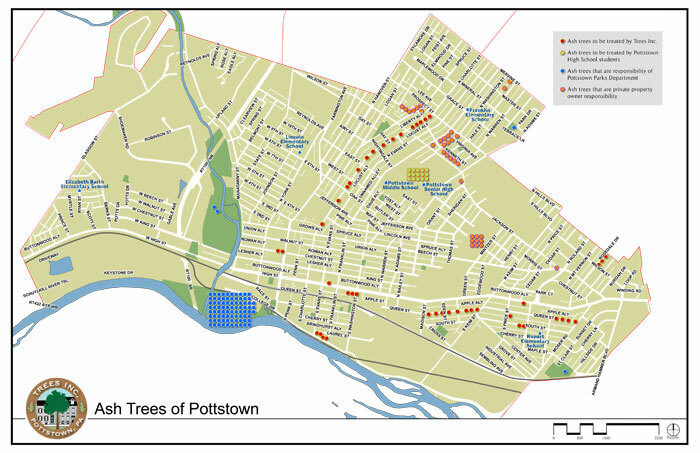 In Pottstown, we have created a map showing where most of the ash trees are located (except some forested areas near the Schuylkill River and Manatawny Creek). 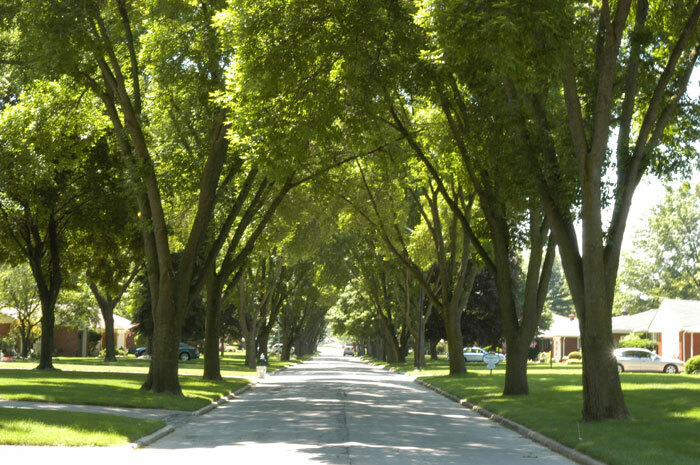 Trees Inc. is treating 130 ash trees in 2014. The annual benefits of these trees, as measured by the U.S. Forest Service's i-Tree program, is $16,277, three times the annualized cost of the treatment. Another 30 trees will not be treated, but rather replaced over time. Here is a supplement we published in The Mercury about the emerald ash borer. Here is the list of trees being treated by Trees Inc. Here is a list of trees that will need to be treated by others.